Making slow changes in your day to day life can produce huge benefits. It begins with thinking about food and taking action. Did you know your body and your brain are tethered? Hippocrates said what goes on in your brain goes on in your body. Another way of saying it from Proverbs is “As a man thinketh, so he does”. With 2/3 of our population overweight, I don’t know many people who are not trying to lose weight or eat healthier. The food industry and media are defining what is healthy for us, and we are mindlessly taking accepting what is said. I ask you to THINK for yourself and examine yourself to see if you are falling prey to the gimmicks. Healthy weight loss does not happen fast. Today we are going to talk about fat. The “experts” are correct when they report that fat is 9 calories per gram, double compared to protein or carbohydrate. This is why sliming down fat intake can cut your waistline. Instead of abruptly deciding no more fat…start slowly by tracking your visible fat and check out a food label or two. Visible fat is fat YOU put on or in your food. Salad dressings, butter, margarine, sour cream, mayonnaise, gravy, cream sauces, peanut butter on toast! Try to use less visible fat this week or eliminate a good amount of it. If your mayonnaise falls off your knife before it gets to your food, you took too much. Use spray oils, make dips less fatty, or gravy with cornstarch and Hauser broth. Use Greek yogurt in place of mayonnaise, sour cream and cream cheese in recipes. Make faux guacamole with thawed frozen green peas, pureed and add cilantro, chopped onions and tomatoes, lime juice and garlic. We love the taste and feel of fat in our mouths, but like many things, intake must be moderated. Procrastination or lack of motivation tends to prevent succeeding with such changes. I hear this statement often… “I just don’t want to mess up my kitchen!” I encourage you to clean your Food Cookery if needed and try recipes using real food. Tomorrow we will talk about fake fats, the phony’s that you will want to avoid. Stay tuned. 1. Get into your Food Cookery (kitchen) and make something! 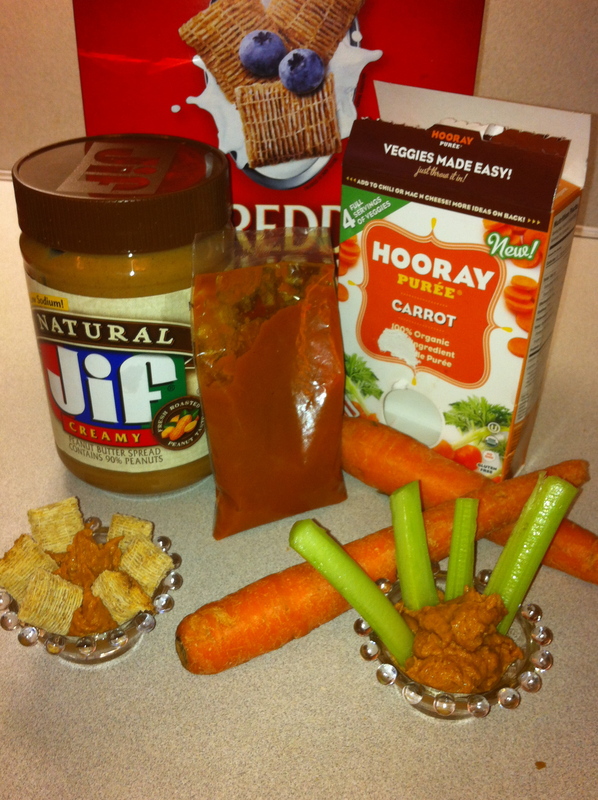 Mix peanut butter with purred carrots. Homemade, baby food, or canned carrots, rinsed, drained and pureed will work. Mix a percentage that tickles your taste. For example: 70:30, 60:40, 50:50 ratios of peanut butter to pureed carrots. This cuts way back on the FAT content. Use as a dip for celery, mini shredded wheat, sliced apple rings or spread as peanut butter on a whole grain cracker. Cinnamon can also be added. 2 T regular peanut butter = 22 g fat.